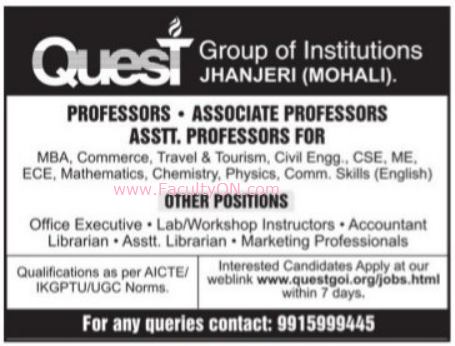 Quest Group of Institutions, Mohali has advertised for recruitment of Teaching Faculty- Professor / Associate Professor / Assistant Professor Plus Non-Faculty jobs vacancies. Interested and eligible job aspirants are requested to apply within 07 days from 28th November 018. Check out further more details below. About College: Known as the best Engineering College in Chandigarh Punjab Quest Group of institutions is the best Engineering Colleges in Chandigarh Punjab and all over North India. It is counted among top 10 Engineering Colleges Chandigarh and offers a wide array of engineering courses at its state of art campus. Being among the Best Engineering Colleges in North India, it effectively caters to the bright minds in the state and the country. How to Apply: Interested and eligible candidates are requested to apply ONLINE at the college web link provided below.